Fly fishing videographer Robert Thompson made a quite a splash last spring when his production, “The River,” premiered at the Rialto Theater in Grayling on the opening weekend of Michigan’s trout season. The circa-1930 movie house filled to near-capacity. The crowd went to enjoy his two-hour feature about the Au Sable River and its Holy Waters, its history, the people who contributed to it becoming one of the nation’s most revered trout streams and what today is being done to keep it that way. Thompson, a native of Alpena, donated the film to the event. The proceeds went to the Anglers of the Au Sable, the nonprofit founded in 1986 that has worked to protect the river ever since. The video took two years to produce, and Thompson was more than a little pleased with the response. It since has sold more copies than any of his other films. “The River” is a gem. It also is my top pick this holiday season, the perfect gift for any Midwestern fly angler. “The River” is available in DVD and Blu-ray formats. It provides an intimate look at Michigan’s most famous trout stream. Its stories are told by the anglers who fish it, the guides who work it and biologists and outfitters who service it. Thompson’s camera work is exceptional, and he blends wonderful fishing footage with the personal insights of those who know and love the river. The DVD includes two other highly enjoyable features: the full 43-minute version of “The Brothers Brown,” another of Thompson’s Au Sable River stories that was featured in the 2013 Fly Fishing Film Tour, and a 25-minute visit with Bob Summers, the legendary bamboo rod builder. “The River” DVD sells for $30. The Blu-ray version is $35. It can be found in fly shops around Michigan and online at Thirdyearflyfisher.com. Two dollars from each sale will be donated to Anglers of the Au Sable. 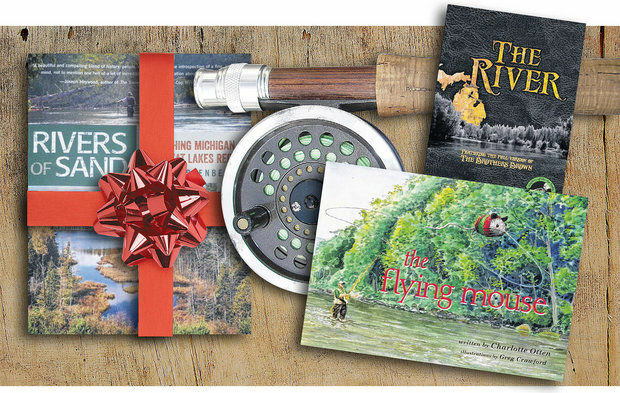 While “The River” is my top choice, a close second is a wonderful book called “Rivers of Sand: Fly Fishing Michigan & The Great Lakes Region,” by Josh Greenberg. It absolutely was my favorite fishing read in 2014. Greenberg, who wrote the book over the course of two winters, is the owner of Gates Au Sable Lodge. He began tying flies for the lodge at the age of 15 and worked as a fishing guide for its former owner, the late Rusty Gates, one of the co-founders of Anglers of the Au Sable. Greenberg and his wife, Katy, took the lodge over in 2011 after Gates’ death. “The main takeaway (for readers), I hope, is that this is a special place worth protecting. I tried to make it a fun and easy read,” Greenberg said. And that he does. Greenberg’s storytelling is lyrical, personal and funny. He takes readers out on the water, where he shares his experiences and sharply honed insights about flies, tactics and trout fishing. Look for “Rivers of Sand” online or at fly shops and booksellers. Published by Lyons Press, it costs $24.95. A third choice this holiday season is a sweet book for youngsters called “The Flying Mouse.” It was penned by Charlotte Otten, a Grand Rapids author. She teamed up with illustrator Greg Crawford to produce a nicely illustrated tale about a red and green striped deer hair mouse that comes to life and enjoys flying at the end of a fly line. Otten said the story was inspired by just such a mouse fly, tied by her son and given to her on Christmas. It is a nice read for children — or by parents who enjoy reading to their kids. Published by Bunker Hill Publishing, it is available in hardcover and costs $17.95. This entry was posted in Uncategorized and tagged AuSable River, Books, Christmas Gifts, Fishing, Fly Fishing, Rivers, Salmon, Trout, Trout Unlimited, Videos. Bookmark the permalink.